Acrylic award with gold Accents and Rosewood piano finish base/frame makes this acrylic award and elegant addition to any desk, shelf or display case. Individually boxed and laser engraved to a white frost color. Available in two sizes. Acrylic award with gold Accents and Rosewood piano finish base/frame makes this acrylic award an elegant addition to any desk, shelf or display case. Individually boxed and laser engraved to a white frost color. Available in two sizes. Full color imprinting available as an optional imprinting method for this acrylic award. This acrylic award is an absolutely stunning patriotic style award that comes complete with ascending 3 dimensional stars routed deep into the surface! This acrylic award provides plenty of room for custom laser engraving, color printing or both! Available in your choice of blue, red, green, gold or purple reflective bottoms. What better way to appreciate the hard work of an employee, associate or customer sales team then to let them know they are a star. The Star Acrylic awards are design to do just that. 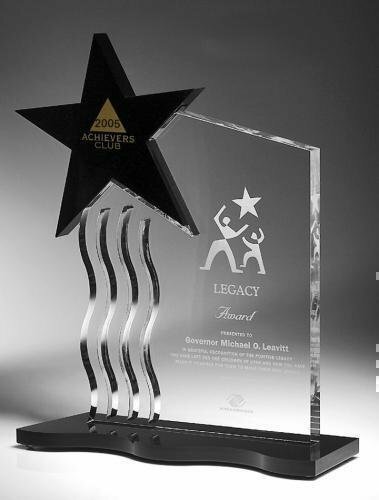 Each of the star column acrylic awards comes with a black lasered to gold plate with personalized message text. This series is available in four different sizes. 3/4" Thick Clear Acrylic Award shaped like a star available in three different sizes, laser engraved to a frosted white text. Full color imprinting available as an optional imprinting method for this acrylic award.